“Isabelle was commissioned by Writers’ Centre Norwich to devise a free family crime trail for children and parents to take part in during Noirwich Crime Writing Festival, in September 2016. She was fully responsible for writing the storyline, choosing and liaising with the locations involved, and designing the clues and props for the event. She was also on-hand at the final clue location all weekend to meet families and troubleshoot any queries. Isabelle is full of great ideas and very dependable and easy to work with, making her a real asset to the Noirwich team. The trail was pitched at the perfect level for children and feedback for the event was very positive.” – Writers’ Centre Norwich give feedback on working with Isabelle. 2016-Isabelle’s short story was highly commended for the Words And Women prose competition judged by Emma Healey (author of international best seller ‘Elizabeth is Missing’) and is published in their anthology by Unthank books. The anthology launched on International Women’s Day. 2016 Isabelle was commissioned by Writers’ Centre Norwich to create and organise a ‘fun for all the family’ trail as part of their ‘Noirwich’ Crime Writing Festival. Isabelle created the concept, wrote the story and clues, designed the route for the trail and chose the nine locations in which the clues would be placed. 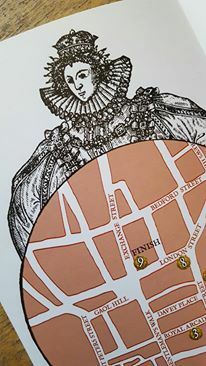 The trail was a ‘Tudor mystery…the case of Queen Elizabeth 1st’s stolen gift of a cup and coins’ based on a real historical event in which the Queen visited Norwich. 2015,Isabelle won an arts journalism competition to be the Embedded Writer at the Family Arts Conference 2015. This involved attending the conference at Cadogan Hall, Rich Mix and Royal Court theatre. The conference featured talks from arts organisations and venues. These talks covered a range of topics from creative development and collaboration to audience engagement, marketing and ticket pricing. Isabelle’s purpose as a writer was to produce a report documenting the conference and to inject some colour and fun into an otherwise formal document. 2014,Isabelle was shortlisted as a finalist for the Writers’ Centre Norwich national fiction competition.